Which communications tools do you see as very important, somewhat important, and least important to you in 2013? Which social media channel are you most likely to add or experiment with in 2014? Which types of content do you expect to spend most of your time producing in 2014? How often do you plan to email the typical person on your email list? How often do you plan to send direct mail? What excites you about your work in 2014? What scares you about your work in 2014? As always, this year’s report is jammed packed with interesting data. But it also includes insight into “potential sources of conflict within your organization” and flags these using conflict box images (very cool and very helpful advice) - watch for these in the full report. Large nonprofits more likely to prioritize brand awareness and thought leadership than smaller ones. Small nonprofits more likely to prioritize volunteer recruitment and retention than larger ones. This is just a quick peek at the highlights of this report. Their fun infographic offers a more in-depth look at the key survey findings – here. 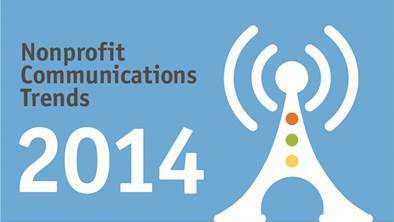 But for all of the details on, for example, what nonprofits are trying to achieve; email, direct mail and print newsletter frequency; donor retention, workloads, challenges and results – you should register to download the entire report here: 2014 Nonprofit Communications Trends Report. 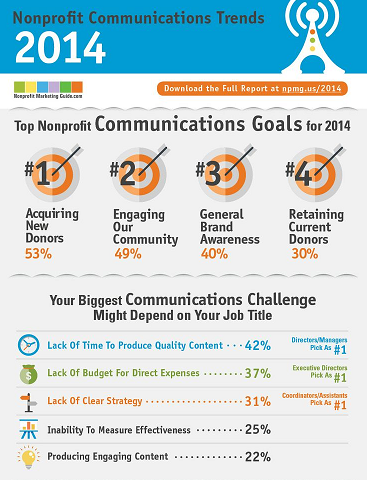 It’s always helpful to know what your nonprofit peers are up to and this report won't disappoint! It offers insight from over 2100 nonprofit executive directors, communications directors, development directors, communications/marketing and development/fundraising folks.